Anchors for fastening are available in many types and are used for light, medium and heavy duty applications and we stock a variety of expansion anchors, screw anchors, bolt and shield anchors, impact anchors and pin anchors including zinc plated wedge anchors, stainless wedge anchors, zinc plated drop in anchors, stainless drop in anchors, drop in setting tool, flat head sleeve anchors, hex nut sleeve anchors, mushroom head spike anchors, short lag screw shield anchors, long lag screw shield anchors, flat head screw anchors, hex head screw anchors, double machine bolt anchors, single machine bolt anchors, calk-in machine bolt anchors, hollow wall drive anchors, hollow wall sleeve anchors, E-Z Drywall Ancors zinc, plastic plug anchors, poly-toggle hollow wall screw anchors, mushroom head toggle bolts, Toggler Alligator Wall Anchors, Toggler Snaptoggle toggle bolts, zamac nailin drive pin anchors, and nylon nailin drive pin anchors. Wedge anchors zinc plated are a non-bottom bearing threaded stud wedge-style expansion anchor for use in solid concrete or grout-filled masonry. Carbon steel and available in 8 diameters and multiple lengths and are set by tightening the nut. Stainless Drop in anchors are concrete expansion anchors with an internally threaded heavy duty machine thread with an all steel shell usually used in concrete construction applications and are set with a special setting tool sold separately. Single Expansion Machine Bolt Anchors or single machine screw anchors are die cast Zamac machine bolt mechanical anchors with a single internal expanding cone and can be used in concrete and some block, brick and stone based materials. E-Z Ancor Self-Drilling Drywall Anchors Zinc are self-drilling drywall anchors for a variety of attachments in gypsum wallboard. Recommended holding weight 50lbs and recommended screws size is #6, #7, or #8. Sleeve Hollow Wall Anchors are designed for use in base materials such as plaster, wallboard, concrete block, hollow tile or plywood and are available in 1/8", 3/16" and 1/4" diameters and in short, long, and extra long lengths. Lag Screw Expansion Shield Anchors or Lag Shield™ anchors are designed for anchoring lag bolts or screws in concrete, block, brick and mortar joints. Short Lag Shield™ expansion anchors are used in hard masonry materials to reduce drilling time. Nailin drive pin anchors are Zamac steel pin drive masonry anchors. Nailin® anchors can be used in concrete, block, brick or stone but not recommended in overhead applications. 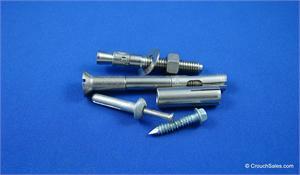 Nylon Nailin® anchors have a pin drive anchor with a body formed from engineered nylon and nails. Nailin pin drive anchors can be used in concrete, block, brick or stone but not recommended in overhead applications. Plastic Plug Anchors are conical plastic anchors designed for light duty fastening applications commonly used with sheet metal screws or wood screws. Poly-Toggle™ Hollow wall anchors are light duty screw actuated hollow wall anchors for use in paneling, wallboard, and solid masonry and available in 1/8", 3/8", 1/2" and 5/8" to match the most common wall thickness and light duty applications. Drop in setting tools are designed for setting drop in anchors. Flat head sleeve anchors are countersunk heavy duty anchors with a split expansion sleeve over a threaded stud bolt with nuts and washers. Hex nut sleeve anchors are heavy duty anchors with a split expansion sleeve over a threaded stud bolt with nuts and washers. Toggle bolts are machine screw spring wing type hollow wall anchors designed for use in block, wallboard and other hollow base materials and consist of a two-part assembly consisting of a mushroom head combo drive machine screw and a spring wing toggle. TOGGLER ® Alligator All-Purpose Wall Anchors are for use in drywall, concrete, brick, tile, plaster, stucco, wood & more where the screw opens the ALLIGATOR anchor and locks its thread into the anchor's teeth to resist pull-out and vibration. Toggler ® Snaptoggle heavy duty toggle bolts pre-install without a bolt and can be installed with a screw gun and usually allows one person installation and are available in 3/16", 1/4", 3/8" and 1/2" diameters. Screws are not included.